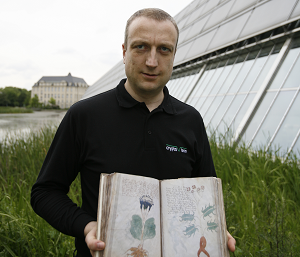 The Voynich Manuscript is solved – or is it? Meanwhile over 50 scholars have claimed to have solved the Voynich Manuscript. The latest alleged solution was published earlier this week in a renowned literature magazine. Does it make sense? The Kennedy murder and the Voynich Manuscript have one thing in common – both have been “solved” dozens of times by hobby researchers and investigators. However, while “solving” the Kennedy murder seems to have gone a little out of style, still one Voynich Manuscript solution is chasing the other. So far, I have introduced only three of these on my blog. It would be no problem to list 50 of them. A few days ago, another alleged Voynich Manuscript solution was published (thanks to Sven Rudloff, Tobias Schrödel, Eberhard Bauer, Stefan Fendt, Knut Junker, and Dr. Ralf Bülow for the hints). This time, the new theory is not the work of a hobby scientist, who has made available his findings on a private website. In fact, Nicholas Gibbs, who discovered this solution, is a professional history researcher. He has published his theory in a leading British literature magazine, which is closely tied to one of the most renowned newspapers in the world – the Times Literary Supplement. 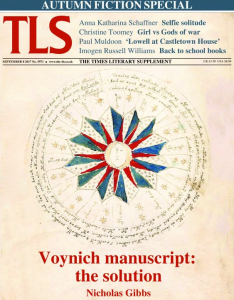 Apparently, Gibbs’ Voynich Manuscript solution is even the title story of the current issue. On the one hand, never has a Voynich Manuscript solution been published in such a prominent magazine. On the other hand, no scientific magazine with peer review (such as the Cryptologia) has reported on this story. As long as no publication of this kind has accepted Gibbs’ findings, I remain skeptical. Gibb’s article tells us a lot about bathing, medicine and herbariums in the Middle Ages. However, the actual solution is not explained in detail. According to Gibbs, the Voynich Manuscript is written in an abbreviated Latin with every letter standing for a word. Though Gibbs writes a few lines about the alleged meaning of this diagram, it doesn’t become clear to me how he derived his alleged Voynich Manuscript solution from it. There’s not much more of cryptographical interest I can find in the TLS article. Announcing a solution to one of the world’s most spectaccular mystery and then giving so little information is not necessarily what I call quality journalism. It can be said that Gibbs’ alleged solution is one of the less spectacular ones. Other Voynich solvers believe that the manuscript was written in some old or lost language or that it was encrypted in a peculiar way. 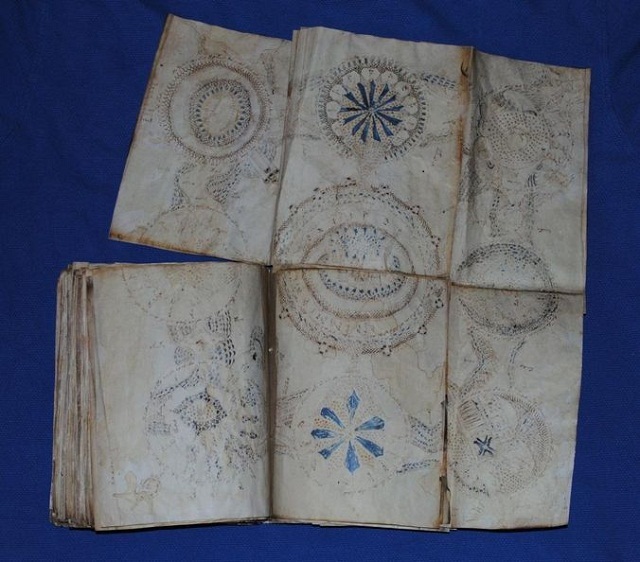 Still others even believe that the Voynich manuscript was written by extraterrestrials. None of these claim has ever been accepted by the Voynich experts. “Definitely”? Anyway, they note different influences here, but then, they stop. The Voynich shows reasonable comparisons to dozens of regions, cultures, styles, eras… but here we have two picked. In his work, he cherry picks several, which suit the theory, and ignores all the very many others. Nice analysis, Rich! You picked up on most of the things that jumped out at me, too. It does sound like he came up with this “solution” in isolation from the VMS community, and so had no peer review to help him get an idea of how much sense he was making. Why the press pick up these things from left field baffles me – and they make such a splash about them! Die Theorie stützt sich ausschließlich auf die Illustrationen des Manuskripts und lässt die Besonderheiten des Textes (Entropie, Funktionale Zeileneinheiten, Wortbildungen) völlig außer acht. Es würde mich wundern, wenn man mit der vorgeschlagenen Methode mehr als fünf Zeilen findet, bei der eine Übersetzung passt. Aber um das wirklich auszuschließen, muss der Herr erst einmal mit Einzelheiten rausrücken. I am of a similar opinion as almost all other Voynich Manuscript experts that published statements about this alleged solution. I am very skeptical, but don’t want to make a final judgement before Nicholas Gibbs has made availabe a detailed description of his alleged solution. 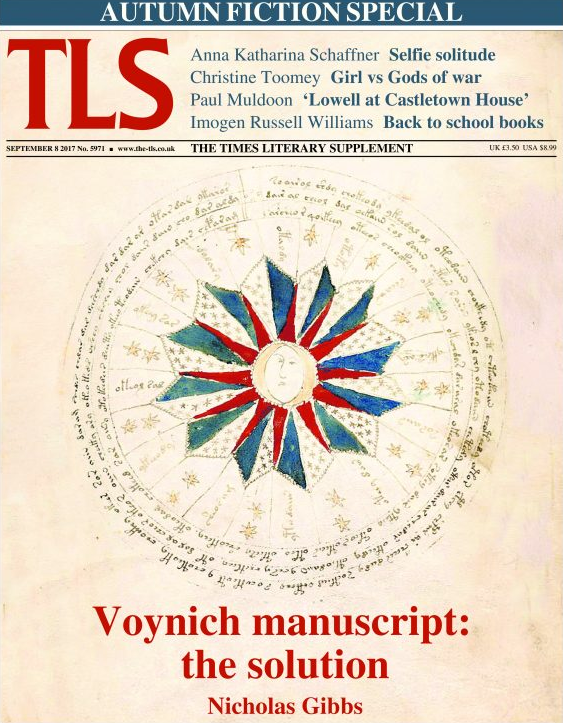 I wonder why such a renowned magazine as the Times Literary Supplement has published such a speculative article with so little content with the title “The Voynich manuscript: the solution”. Naming it “A New Voynich Manuscript Theory” would have been a lot more appropriate. As frequent readers of this blog know, I recently published a test that helps to confirm the validity of alleged Voynich Manuscript solutions. I recommend Gibbs to take this test. gibs das auch noch mal in deutsch? Stay Passenger ……. Why Goest By Thou So Fast? Bonesman at Yale are so funny aren’t they? Well, yes… but where are they in the Vms “cylinders”? Rather than “plainly” being just like these stoves, I’d say it is one of the worst comparisons I’ve seen… and we’ve seen inkwells, perpetual candles, and of course, pharma and herbal jars. Red flag again: “It was the best of works, it was the worst of works”. Optical device! Well, yes, I feel this is most likely the case… but then, some theories pose a time when such optical devices were possible, while this one? What “optical device”? The camera lucida was not invented until about 1807. So, a camera obscura? And is he implying it is “from life”? But then, there is clearly no exact comparison to the ports and buildings they claim are being copied in them, so why do they think this in the first place? But no translation, only a smattering of examples. As you know I often point out, the Friedman’s explained, a successful translation must be both repeatable by someone who only knows the system, and two, make sense. Most “solvers” know this, so we rarely see but a few words. Maybe I missed it, but this “solution” shows no translation, nor list of words to plug in, to do so oneself. Another “red flag”, i.e., “If my theory does not make sense, it is because stuff is missing or added. It WAS there, the proof is just gone now…”. There are many, many other problems with this. Many terms are thrown in there without explanation… many claims without evidence. The comparisons hinted at are not shown, and when looked up, are not good; the circles are called “spheres”; the mention of optics, without explanation; the claim that Pleiades is shown, without comparison; along with the noted ignoring of various large elephants in the room, and on. I only imagine that this person worked in isolation, as I did when I worked on my Drebbel theory. I mean, I don’t think he got any critical feedback, or if he did, he recoiled from it, and didn’t take it to heart. This kind of glib, navel-gazing, speculative, media-fuelled nonsense is what has poisoned the Voynich research well so comprehensively, and is part of the reason I don’t review crappy Voynich theories any more. Shame on the Times for gullibly publishing such ungrounded rubbish without even the semblance of fact checking. Articles like this waste everyone’s time, and are about as close to institutionalized trolling as you can get. Ich hätte da eine Frage. Gibt es irgendwo Informationen zur Buchstabenhäufigkeit mittelalterlicher Sprachen bzw. inwiefern sich diese in einer Sprache über die Jahrunderte verändert hat ? Speziell suche ich nach Informationen über Italienisch. I have a detailed response to Nicholas Gibbs’ “detailed description of his alleged solution”. It contains four letters, Cesar substitution: D S B Q. Don’t misunderstand me – it’s a clever way to make your money, and climb the academic ladder. All you have to produce is: C R A P.
Gibbs admits himself that he is only reading something into the manuscript. He wrote himself “But interpretation of such abbreviations depends largely on the context in which they are used.” If he would be able to read the text it wouldn’t be necessary to know the topic before reading it. Selbstverständlich gibt es solche Dinge wie Frequenz-Analysen, Lautverschiebung und sonstige linguistisch-statistische Untersuchungen zur Entwicklung von Sprachen über historische Zeiträume hinweg. Insbesondere die deutsche Sprache des Mittelalters weist da eine enorme Vielfalt auf, vor allem im südlichen Sprachgebiet zwischen dem südwestlichen Alemannischen bis hin zum südöstlichen Bairisch-Österreichischen in Tirol. Eine “einheitliche” Information gibt es nicht, da es keine einheitliche mittelalterliche Sprache gab. aber dem Klerus vorbehalten blieb, da nur ein ganz winzig kleiner Teil der Bevölkerung überhaupt Lesen und Schreiben konnte. Die lokalen Idiome blieben davon tatsächlich weitgehend unberührt und sind es sogar teilweise auch heute noch. Wenn du dir erhoffst, über statistische Analysen italienischer spätmittelalterlicher Texte den Voynich Codex zu knacken, dann muss ich dich enttäuschen. Das haben schon zahllose andere mit Null Ergebnis versucht, ganz einfach weil das VM nicht in Italienisch und auch nicht in Latein geschrieben ist. Denn würde das eine oder das andere zutreffen, dann hätte man schon längst eine zweifelsfrei saubere Transkription. Hat man aber nicht. If Gibbs needs Cappelli’s book to get an idea how medieval abbreviations work it is quite worrying. As a manuscript scholar you very rarely have to use the book since you get so used to the abbreviations. Furhtermore, Cappelli’s abbreviations cover a long time period and most of Europe, which means they weren’t in all in use at the same time and therefore most likely not known to late medieval/early modern scribes. One notices that when looking at copying mistakes in later manuscripts that are the results of misread abreviatiions. Of course, some “letters” look indeed very similar to specific symbols used for abbreviations in the late middle ages (e.g. Symbol for -us, symbol for -er/ir) and also the letters 4 (in the “half 8 form”) and propably 5 (in the form similar to modern 4) seem to appear (as loads of people have proabably pointed out already). I don’t think this would help to decipher the book, but do people think it helps to date the manuscript? The older forms for the numbers disappear during the second half of the 15th century. I would be grateful if someone could point out serious scholarship by medieval manusript experts on the book as an object (not so much on the content). Klaus. The manuscript is written in Czech language. And decoded by Jewish substitution. In Germany, you do not have the chance to translate and understand the manuscript. Manuscript 408 is not alchemy, herbal, pharma, astrology. The manuscript was written by Eliška of Rosenberg. There is probably so much in common with Germany. She went to Germany. Her husband was. Hendrik Graaf van Hardegg. Machlade Vrijheer van Stettenberg. ( 1460 – 1513 ). @Nikolai: Can you pass this test?